Arthur Wiknik, Jr. served in Vietnam with Company A 2/506th of the 101st Airborne Division as an infantry squad leader from April 1969 to March 1970. He was one of the first in his unit to safely reach the top of Hamburger Hill during the final assault. A few months later, he prevented a possible attack on a remote firebase by discovering a nearby enemy weapons cache. Arthur's writing credits include stories in eight different Chicken Soup For the Soul books. He has also had articles in Army, Soldier of Fortune, Players, North American Whitetail, Rural New England, Heading Out and The Deadly Writer's Patrol magazines. Proud of his military service, Arthur gives talks at schools, colleges and civic organizations about his Vietnam experiences. A dedicated community volunteer, Arthur is a 18-year member of the Haddam Memorial Day Parade Committee, is a founding member of the Haddam Veteran's Museum and is a life member of the Veterans of Foreign Wars. Arthur lives in Connecticut and works as a Quality Analyst. He is available for book signings and to give presentations on his Vietnam War experiences. 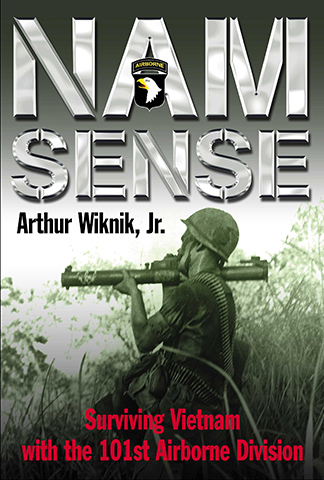 "Nam Sense is one of the best books I have ever read on the Vietnam War. Anyone who was on the ground in Vietnam will recognize every sight, sound and situation. This riveting memoir is the real deal." Cover photo - Ignoring enemy fire, SSG Oscar C. Gallegos, Co. B, 2nd Bn, 327th Infantry, 101st Airborne Division takes careful aim with the M-72 LAW (light anti-tank weapon) during Operation Wheeler, northwest of Chu Lai, Vietnam in the fall of 1967. SSG Oscar C. Gallegos was KIA 05/11/68. In 2012, Arthur Wiknik was Lou Diamond Phillips’ guest on the Military Channel’s An Officer and a Movie to discuss the 1987 Vietnam War movie Hamburger Hill, as well as Arthur’s experiences in the battle. In 2011, The History Channel’s Vietnam in HD series premiered. It featured eleven Vietnam War veterans (including Arthur Wiknik) and two civilians with a strong connection to the war. The six-hour program was structured similar to the Emmy Award winning World War II in HD series where viewers saw and heard each veteran tell their story. A dozen top Hollywood talents portrayed the younger voices of those being profiled. Actor James Marsden was the voice of Arthur Wiknik. Nam Sense wins Honorable Mention! The Military Writers Society of America has awarded Nam Sense their 2010 Honorable Mention for a memoir. In 2010, Scholastic published VIETNAM – The Bloodbath at Hamburger Hill, a high school history book that features the Hamburger Hill battle experiences of Frank Boccia from 3/187th, Michael Serrano from 1/506th and Arthur Wiknik from 2/506th. On May 20th, 2008, the 39th anniversary of the battle for Hamburger Hill, a Hamburger Hill 20th Anniversary movie DVD was released by LionsGate Films. The special features in this re-release were produced by Drissi Studios in Burbank, CA, who called upon Arthur Wiknik to provide commentary and photographs for the DVD. Arthur’s unit was involved during the last three days of the battle and he is proud and honored to have fought alongside men of the 101st Airborne’s 3/187th who bore the brunt of the fighting and took the heaviest losses. The 1987 film has not changed but in the new release is a feature titled Hamburger Hill: The Appearance of Reality that includes commentary with the original actors, director and producer on the making of the movie. Most of the photographs in this feature were supplied by Arthur. Hamburger Hill veterans Douglas Gagne and David Robbins who served in Co. A 2/506th also supplied photos. A second feature titled Medics in Vietnam is where you will see and hear Arthur, as well as a few more of his photographs. On October 7, 2005, Arthur Wiknik received a dog tag he had lost in South Vietnam in 1969. The tag, along with hundreds of others, was purchased from a street vendor in the city of Da Nang by Bryan Marks, co-founder of VietnamDogtags.com. After a heartwarming and confirming conversation with Bryan Marks, the lost tag was returned. VietnamDogtags.com performs this service at no cost to Vietnam veterans and their families as a show of appreciation for their military service. To date, they have returned over 500 dog tags to Vietnam veterans and their families. Additional lost dog tag sources can be found on the Related Links page. The VietnamDogtags.com web site is not available at this time. Veteran’s Memorial Park in Glendale Heights, IL (west of Chicago) features a series of stone tribute stations depicting the stages of military service. The Coming Home station contains paraphrased quotes from Nam Sense that describe leaving the Vietnam War zone and landing safely on American soil.